As I mentioned in my previous post that I haven’t been making a lot of cards recently but this past weekend was one of our nephews 16th birthday, so I decided to try and make a card for him. I decided to use a card sketch to make it a bit easier for me and so went with the Mojo Monday sketch 304. 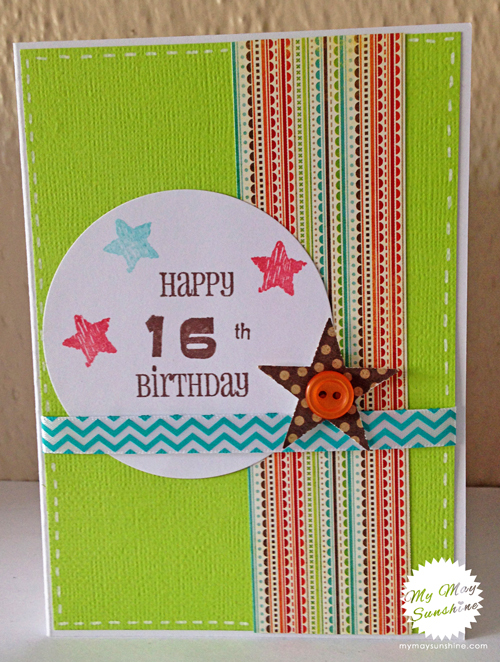 My card style is quite simple but has a lot of colour, so as this card was for a teenage boy it helped to keep it simple. Paper – My Minds Eye | Card – American Crafts | Stamps – Banana Frog and Amy R | Ribbon – American Crafts | Star punch – Fiskars | Button – Sew Sweet. Next Post woyww 227 – what’s on my desk.